So everything is moving up in the wonderful wide world of vaping, with the newest and greatest of mods coming out every week, and there is the problem right there. Every week or so the newest mod comes out and we have to have it, we can’t let anyone else have it before us and we make a huge deal out it, let’s face it we are only human it is going to happen and there isn’t anything wrong with that at all! But in my view, it is causing people who haven’t moved up in to the newer or more powerful mods or maybe who lack the financial funds to be able to move up to feel left out! To the point where they are starting to think their options aren’t valued when it comes to vaping because they aren’t on the newest technology. For me this has got to stop. Face book for example is a brilliant way of networking learning having a laugh and generally being around like minded people who just want to talk about vaping. Uploading videos has become a hobby for me, And I say hobby, But I genuinely care about people and want to help as many people as I can, so it kind of saddens me slightly to hear of people who are too scared to upload a video because their vapour clouds aren’t quite as big as someone else’s. Let’s all band together, and get people feeling confident enough to be able to get involved and upload videos and share their views with us. 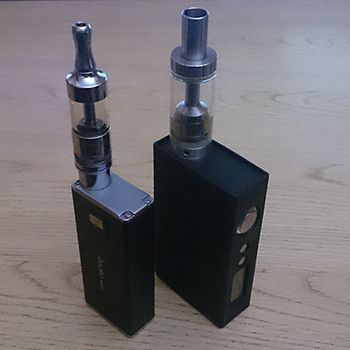 Ego Starter kit, or Dimitri Parallel box mod does it really matter? it is still vaping and we have different experiences, the fact I might have an ego and you might have a Dimitri box doesn’t matter, the fact is we are both on the same path and we are both vaping. So to all those who are hiding them self’s away, I know I stand for a lot of us when I say we want to hear from you! We would love you to come forwards and be able to get involved no matter what device you have! This entry was posted in Vapeology and tagged clouds, Dimitri, mod, vaping, Vapour. Bookmark the permalink.